Upper Playground and FIFTY24SF Gallery have released new San Francisco special edition prints by INSA in conjunction with his ongoing exhibition AT FIFTY24SF Gallery entitled 'MORE'. The prints are new takes by INSA on the now classic 'Heel' image that began to enter his work in 2004. In the beginning, the image was simply an attempt to depart from the traditional macho driven culture that dominated graffiti - but has since become one of the defining images of INSA's career and has been seen on countless walls in cities across the world. The San Francisco editions of the prints come in six neon color ways and variations, to coincide with the neon murals that INSA accomplished throughout San Francisco over the last couple weeks. Each print is executed as two colour silkscreens made using solvent based inks on Fabriano 5 300gsm paperstock. 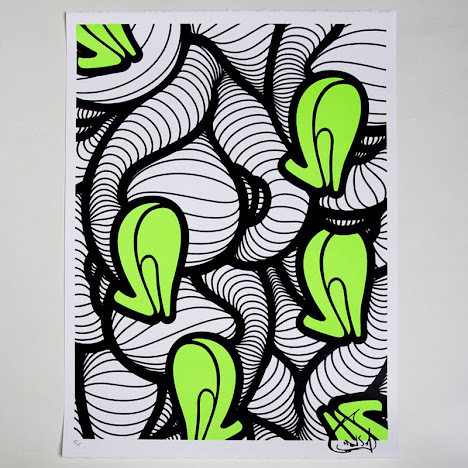 The prints measure 20" x 28" and are signed, blind-stamped and numbered by INSA. Each color is limited to an edition of 15 and priced at $150 per print. The prints are available on Upper Playground's online shop here.